Earlier this week the 2nd Edition of the Open Data Barometer launched: a project I’ve worked on over the last two years, helping design the original framework of indicators, setting up the data collection tools, and writing up the report (with a fun learning curve this year to try and make it an interactive web-first report as much as possible). Putting together a study like the Barometer is a long and, at times, torturous, process. So I was really interested to see that this week the Open Data Institute also released a report on “Benchmarking Open Data Automatically“. Could there be ways around the costs and time commitments of survey based techniques to understand the open data landscape? Unfortunately, at least so far as the report explores, it seems not. Below I offer a critical reading and reflection, addressing both some substantive issues for consideration in taking forward efforts around automated open data measurement, and raising some general issues about the problems of approaching research with an automation lens. Credit to the authors: they do not at any points overstate the claim for automation, and provide a fair overview of its potential. However, the methodology of the report in identifying suggested indicators and datasets §4 is unstated and unclear, and given it is framed as an output of the developing country focussed Partnership for Open Data (POD), critical consideration of the global applicability of its suggested models appears absent. The report looks at the potential for automated assessment in four areas, building on the Common Assessment Methods framework for open data which covers context/environment, data supply, use & impact. The suggested automation approaches for Context/Environment variables either involve the secondary use of global indicator data, or propose the use of text-mining approaches on legislative or communicative texts from government. Both these are problematic. Firstly, the report does not appear to consider that the secondary data it wants to draw upon is far from automated itself, but instead is the product of in-depth qualitative research processes, each with their own dynamics and biases. By framing use of this data as a strategy of automation, rather than a strategy of secondary data use, it glosses over the important critical attention that needs to be given when drawing on indicators from elsewhere, and over questions of whether these proposed indicators are adequate to capture the constructs being sought. In the Open Data Barometer model, primary survey data is paired with secondary indicator data (a) to address the gaps in each; (b) to ensure each component of the ‘Readiness’ Barometer sub-index is based on a plurality of data sources, to limit the potential effects researcher bias. Secondly, the idea that it will be possible to effectively infer meaningful information about open data policies from automated reading of legal texts is highly questionable. Not only are legal texts often inaccessible online, but the range of languages, and legal cultures, any analysis would have to deal with begs the question of whether it would not be more efficient in any case to work with bi-lingual scholars than computational techniques. The report fails to cite any examples of studies that have proven the value of such automated text-mining approaches in an international comparative context. Furthermore, automated techniques bring in a big risk of imposing normative assumptions (particularly in this case Western, Anglo-saxon legal tradition assumptions) about law, policy making, and what constitutes effective policy. When I carried out my initial policy analysis of open data in six countries though a qualitative reading of policies, it became clear that it was important to look at the function, not just the form of words in policy documents – and to understand the different ways policy operates in different countries. Should one country be assessed as having a better environment for achieving the promised impacts of open data because it uses the words ‘open data’ in laws, than one which talks about ‘free and digitally available public sector information’? I would be extremely cautious about such possibilities. One of the weaknesses of the Open Data Barometer as it currently stands is that it assesses only at the National level, whereas in many federal states particular policies or datasets that it is looking for from a national government are devolved to states and sub-national jurisdictions. Working with the complexity of the real world generally requires greater resource for critical analysis and research, not more automation. What it doesn’t flesh out is the fact that this makes getting at research constructs that can represent the range of data published, or the broad usability of data, as opposed to constructs that in fact pick out primarily the quality of meta-data, is particularly challenging. It also perpetuates the idea that open data involves cataloguing data in data portals, rather than making data broadly accessible, published so that citizens can access it alongside government information, embedding a culture of data publication across government, rather then treating open data as some centralised responsibility. Such meta-data centric metrics are also inherently open to gaming. If a metric, for example, is based on the percentage of datasets, discovered through a meta-data catalogue, that conform to some automated tests for quality (e.g. the UK Governments ‘openness score’), then the easiest way to up your score is to drop from the catalogue datasets that don’t meet the quality bar. Sensitivity to gaming has is vital to any analysis of metrics: particularly those seeking to create behaviour change. If its possible to change the metric scores by changing behaviours other than those the metric aims to target, then there need to be feedback loops to control for this. These often exist just as part of the processes of analysis in qualitative research, but need to be explicitly planned for in any automated methods. When it comes to data use assessment, much more promising (albeit resource intensive) I suspect are the bottom up methods for assessing the value of open datasets for particular use cases being explored by some of my Web Science DTC colleagues at the University of Southampton. The report notes that “measuring impact with an automated approach is inherently difficult”. The Open Data Barometer uses, as a proxy for impact, the peer reviewed ‘perceptions of impact’ amongst informed researchers, based on being able to cite media or academic literature that connects open data and specific impacts. Whilst the expert judgement can’t be automated – it would be useful to consider where automation could support the researcher in locating relevant sources. For example, right now researchers have to go out and track down news stories, and there are some inter-coder reliability issues that are likely to arise as a result of different search strategies and approaches. But the same technologies proposed for text-analysis of legal documents, rather than producing an output metric, could produce a corpus of sources for human analysis – helping dig deeper into sources of the stories of impact. A similar approach may be relevant to researcher assessments of datasets and data uses as well: using online traces to support researchers to locate and profile dataset re-use, but recognising the need for assessments that are sensitive to different contexts and cultures (e.g. for some datasets, searching on GitHub can turn up all sorts of open source projects that are re-using that data, but this only works in countries and cultural communities where GitHub is the platform of choice for source code sharing). Should we reject all automated methods in open data research? Clearly not: projects like the Open Data Monitor, working in the European Context of a single market and substantial cross-government standardisation already, and concepts like Ulrich Atz’s Tau of Open Data, have the potential to offer very useful insights as part of a broader research framework. And the kinds of secondary data consider in the automation report can be useful heuristics in understanding the open data landscape, providing they are read critically. However, rather than focus on automated measurement, focussing on tools to help researchers locate sources, collate date, and make judgements may be a much more appropriate place to focus attention. Big data methods rooted in working with volume and variety of sources, rather than meta-data driven methods that require standardisation prior to research are likely to be much more relevant to the diverse world one encounters when exploring open data in a development context. See the full call here. In efforts to increase openness, transparency and participation, governments around the world have drafted Open Government policies and established Open Data as an integral part of modern administration. Open data and public sector information has been held out as a powerful resource to support good governance, improve public services, engage citizens, and stimulate economic growth. The promises have been high, but the results have been modest so far and more and there are more and more critical sounds. Policies have not resulted in gaining the desired benefits and implementations have been criticized for its technology orientation and neglecting the user perspective. These policies and implementations are now under scrutiny, with important questions to be asked about: whether the results justify the efforts; about how different outcomes from open data can be secured; and who is benefiting from open data in different countries and contexts? Global perspectives: open data as a phenomenon of developed countries, or a global phenomena? Differences and similarities across countries, cities and regions. The impact of open data on the public sector workplace of the future: personal opinions and a human-face vs. administrative decisions and procedures. Open data is both a social and technical phenomena, and studies are needed that explore the interaction of technology and policy. Many national data portals from Germany and Austria to the USA and the Philippines, already adhere to agreed meta data standards for describing data, and the G8 Open Data Charter has committed members to harmonising meta-data. However, open online data by its nature makes not halt at national or organisational boundaries. To deliver on the European Digital Agenda 2020 vision of digital common market, the UN vision of a post-2015 ‘data revolution’ enabling greater coordination, of the goal of advocacy organisations in joining up data from across countries to track financial flows and to root out corruption, it needs to be easier to join up data across countries. The European Commission has already elaborated a meta data description to help bridge data from different EU member states administrations and to mitigate language barriers of data descriptions, and efforts are ongoing to develop a wide range of open data standards, covering issues from aid and public contracting, to parliamentary records and public transport timetables. This accumulated knowledge is collected by the SharePSI-project and should inform the W3C working group Data on the Web. Increasing open data interoperability is an ongoing and current challenge which administrations worldwide have to deal with. Length of paper: 7,500-12,000 words, all drafts have to be typed double-spaced, the format has to be Word for processing reasons. 2014 is going to see a lot of Open Data conferences and events around the world, particularly in developing countries, where open data has become part of the donors discourse. And a lot of these events are likely to be packed full of anecdotes and examples of open data applications and websites drawn from the USA and Europe, and presenters whose main contributions to open data have been made in the leading cities of high-tech stable democracies with decades or centuries of systematic governance data collections and records. The stories they can tell are often inspiring – and can spark many ideas about how government could be done differently, or how citizens can use data to drive bottom-up change. But the stories they tell should not be taken as templates to transferred and applied in different countries without consideration of the vastly different contexts. As the Open Data Barometer demonstrated, many developing countries don’t have consistently collected state datasets just waiting to be opened up, and may have much smaller technology communities to draw upon in mediating raw data into useful platforms and products. In the Open Data in Developing Countries research network we spent time in Cape Town a few weeks ago discussing the need to split apart the packaged definition of open data offered by most high-profile advocates, recognising that for much of the data in the South it may make sense to focus on just one or two of ‘Proactively Published’, ‘Machine readable’, and ‘Legal permissions to use’ in the first instance, working progressively towards increased openness of data, rather than treating open data as a binary all-or-nothing state. The importance of adapting open data ideas to local contexts has been a key theme throughout the emerging research findings: but it’s not one we often hear from conference platforms. In the conferences next year then, we need to be hearing more voices from those who have been grappling with open data from African, Asian and Latin American perspectives, as well as those from all continents who have been exploring open data outside the capital cities and with grassroots groups. Shifting the practices of the state, of its interlocutors, of citizens and businesses to be ‘open by default’, and ensuring the net-gains that can bring are fairly distributed, is not a simple task – and its one that even leading advocates of open data have only taken the first steps towards. Where we are bringing examples across country contexts in presentations, we need to do more to distill and express the theories of change behind open data impacts, and to open that up so that different countries can work out how to fit the open data vision and agenda into their local political, technical and social realities. And we need to explore the different theories of change emerging across different sectors and countries to understand how the core idea of open data can be assembled in many different ways to bring about change. Getting more diverse voices onto the podium in 2014 is a good way to start that. I was speaking at the Institute for International Economic Policy this afternoon at George Washington University at a conference on “Known-Knowns and Unknowns about the Internet: Measuring the Economic, Social, and Governance Impact of the Web“. The input I offered, for a session under the title ‘Has the Internet Helped Citizens and Policymakers Improve Governance? Are the effects measure-able? What new innovations might be helpful?’ was around how we approach measuring the impacts of open data. Below are the notes I prepared for the talk: the actual delivery voyaged off this a bit – but the version below is probably a bit more clear and concise. You can also find a recording from the whole panel session here , including a fantastic talk from my Web Foundation colleague Bhanupriya Rao on No-tech, low-tech and high-tech for transparency. Lastly, we have the idea of co-production and more collaborative governance in which open data supports groups made up of citizens, civil society organisations and entrepreneurs to work together with each other, and with the state, to improve policy making and practice. Here, governance is improved when it is more inclusive, and when more people participate in determining the outcome of collectively held power. That framed our expiration with the Open Data Barometer, a study launched by Sir Tim Berners-Lee at the Open Government Partnership meeting in London a few week ago that takes a multidimensional look at the readiness of 77 states to secure benefits from open data, the implementation of open data policy via the proxy of dataset publication, and emerging impacts of open data by the proxy of media and academic coverage of it. Last Thursday the study I’ve spent the last five month working on with the Web Foundation was formally launched in the Open Government Data Working Group session of the Open Government Partnership Summit. The Open Data Barometer takes a look at the context, implementation and emerging impacts of open government data in 77 countries around the world. Last week’s launch included both an analytical report and quantitative datasets for the secondary indicator and expert survey data collected in the study. I’ll be writing more in the coming weeks here about the process of designing and carrying out the study, and reflecting on how it might evolve and be built upon in future. But for now, here’s a link to where you can download the report and data, findings from the exec summary, and a few charts pulled out from the overall report. OGD policies have seen rapid diffusion over the last five years, reaching over 55% of the countries surveyed in the Barometer. The OGD initiatives launched have taken a range of different forms: from isolated open data portals launched within an e-government framework, through to ambitious government-wide OGD implementations. But – there is still a long way to go: Although OGD policies have spread fast, the availability of truly open data remains low, with less than 7% of the dataset surveyed in the Barometer published both in bulk machine-readable forms, and under open licenses. This makes it unnecessarily difficult for users to access, process and work with government data, and potential entrepreneurs face significant legal uncertainty over their rights to build businesses on top of government datasets. Leading countries in the ODB are investing in the creation of ‘National Data Infrastructures’ to provide a foundation for public and private innovation and efficiency. They have high-level and broad-based political backing for the OGD initiatives, and are investing in capacity building with entrepreneurs and intermediaries. They are also focussing on building communities around open data, convening government officials and outside stakeholders to understand more clearly how data can be harnessed for economic and social progress. However, no countries can yet claim to fully be ‘open by default’, and embedding OGD practices across government is a key future challenge. Mid-ranking countries have put in place some of the components of an OGD initiative, such as an open data portal and competitions or events to catalyse re-use of data, but have often failed to make key datasets available, and are lacking in important foundations for effective open data re-use. Absence of strong Right to Information laws may prevent citizens from using open data to hold government to account, and weak or absent Data Protection Laws may undermine citizen confidence in OGD initiatives. In addition, limited training and support for intermediaries may mean data cannot be mobilised to generate economic and social benefits. Low-ranking countries have not yet started to engage with Open Data, and many developing countries lack basic foundations such as well-managed and digitised government datasets. In these countries, interventions to support OGD may look radically different from the leading OGD initiatives surveyed in the Barometer – with opportunities for open data approaches to be used to generate, as well as use, public information. The Barometer ranks the UK as the most advanced country for open data readiness, implementation and impact, scoring above the USA (2nd), Sweden (3rd), New Zealand (4th), Denmark and Norway (joint 5th). The leading developing country is Kenya (21st), ranking higher than rich countries such as Ireland (29th) and Belgium (31st). However, no country can yet claim to be fully ‘open by default’. Different countries and regions face different challenges in pursuing OGD – including the need to build government data collection and management capacity; the need to support and equip innovators and intermediaries to use data; and the need to secure civil society freedoms that will enable the use of open data for effective transparency and accountability. There is no one-size fits all approach to OGD. Key datasets such as Land Registries and Company Registries are least likely to be available as open data, suggesting that OGD initiatives are not yet securing the release of politically important datasets that can be vital to holding governments and companies accountable. In most countries, key datasets for entrepreneurship and improving policy are not available as open data, and when published are in non-standard formats. For example, even in the case of public transport, where data standards are well established, just 25% of countries surveyed have machine-readable data available. Mapping data is also often unavailable in digital forms, or only available for a fee, suggesting that inefficient charging for public data continues to be an issue in many countries. Categories of data managed by statistical authorities are the most likely to be accessible online, but are often only released in very aggregated forms and with unclear or restrictive licenses. Adding a focus on open data to statistical agency capacity building may assist in making key datasets available as bulk, machine-readable open data, contributing positively to the ‘data revolution’ (UN, 2013). Strong evidence on the impacts of OGD is almost universally lacking. Few OGD programmes have yet been evaluated, and the majority of discussion of impacts remains based on anecdote. The Barometer asked about six kinds of OGD impact (government efficiency, transparency and accountability, environmental sustainability, inclusion of marginalised groups, economic growth, and supporting entrepreneurs). In countries with some form of OGD policy (n = 43) in 45% of impact questions no examples of impact could be found, and on average evidence of impact was scored at just 1.7 out of 10. Scores were particularly low for inclusion and environmental impacts of OGD, suggesting an area in need of further focus. It remains very early days in the development of OGD practices. The World Wide Web has now been with us for almost 25 years, and, even so, many governments, businesses and civil society groups are still in the early stages of learning how to harness its potential. The open data vision is a bold one: but one that will take considerable work to make a reality. It cannot just be a case of ad-hoc dataset publication, but needs attention paid to legal, social, economic, technical, organisation and political dimensions of open data publication and re-use. This year’s Open Data Barometer provides a baseline for tracking how we collectively progress in the open data arena in years to come. I’m in a workshop at MIT today about plans to create a ‘Web Observatory’, collecting and curating vast quantities of data from across the web for research – in part to ensure that researchers can keep pace in their capacity to research the web with the companies and entrepreneurs who are already gathering terabytes of ‘traces’ of online behaviours in proprietary platforms. A lot of the discussion so far has looked at datasets for research gathered from platforms such as Twitter, curated data from platforms like Open Street Map, or collected in focussed research projects focussed on sensor networks and ‘humans as sensors’. However, the vision of the Web Observatory is not just about providing a catalogue of data for secondary research, but also about providing methods and tools that enable researchers to “locate, analyse, compare and interpret useful information in a consistent and reliable way … rather than drowning in a sea of data”. As Wendy Hall noted in opening remarks, whilst the Web Observatory work begins with emphasis on academic researchers as the users of data, in the long run, Observatories could (or should) be accessible to individuals also. The growing imbalance of power created between citizens and companies through the privileged access that corporations have to information on our collective social lives is set to become an increasingly pressing social and political issue. Now, there are clearly big technical challenges ahead in building the Web Observatory project and the many federated Web Observatories that will result, but in this post I want to briefly explore one of the organisational ones: getting the governance and sustainability of Web Observatories right. If you’ve ever spent time exploring Linked Data projects you will have likely stumbled across a lot of abandoned datasets. One off conversions of open data; or data generated through now defunct research projects. The Web of Linked Data is far too often a web of broken links – as the funding for research projects runs out and links go dark. The Linked Data Around the Clock programme (on a website that’s now offline ) had a slide that captures the coordination dilemma at the heart of creating and sustaining good Linked Data: the value of (linked and/or open) data accrues to a range of parties, and involves input from a range of parties. When projects are sustained through short-term grant funding, which covers all the work to create, curate and make accessible a dataset, then that data is sustainable only so long as the funding continues. It could be argued that when data is open, this is not so big a problem – as someone can simply take a copy of the data and if the original source goes dark, can bring up an alternative host for the data. But in practice, with Web Observatory datasets we’re talking big data where simply storing the datasets can require hundreds of terabytes storage; and datasets which cannot be entirely open due to privacy concerns or Terms of Service of the source data. The data also tends to be shaped primarily by the needs of the funding project that creates it, not by the needs of the projects that want to re-use the data. Although linked data promises distributed annotation and enhancement of data, in practice to query data it needs to be aggregated together in one place – and it’s more efficient to pool resources to enhance and maintain one data store, than to try and copy, convert and enhance multiple copies of big datasets. So: if learning from Linked Data is anything to go by, the Web Observatory needs to be thinking critically from the start about how key datasets will be sustained, and how collaboration on enhancing data will be facilitated – recognising that there is a non-zero net cost (lots of near-zero marginal costs add up quickly in big data…) to enhancing and adding data to someone else’s data store. Many of the datasets that might be contained in Web Observatories will raise significant privacy concerns. It might be tempting to manage these by simply deferring responsibility for judging what use can be made of the data to Institutional Review Boards and ethics committees at different participating academic institutions – if the Web Observatory programme is to be open to partners beyond academia, then ethics processes need to be placed into the heart of the Observatory governance structures, rather than managed around the edges. Observatories hosted and held-in trust by institutions: institutions, primarily academic, use fixed-term project funds to set up Web Observatories. They let other people use these so long as their funding allows, and prioritise those requests to enhance, extract or work with the data that fit with their own research goals. At the end of the project funding, Observatories either die, or end up maintained through residual or other funds. Independent foundations: the model used by large web public goods like Archive.org and Wikipedia – establishing independent legal entities that maintain an Observatory. This has the value of helping Observatories out-live the projects that start them – but makes Observatories dependent upon finding their own funding, and creates an extra organisation entity over and above the partners with an interest in the data which either ends up with it’s own agenda and organisational imperatives, or which leaves a collective action problem with each of the partners waiting for the others to provide the funding to keep the lights on. Data co-operatives: building on discussions convened last year in Manchester, there may be a new organisational structure the Web Observatories can build upon – that of the data cooperative. In a data cooperative, a light-weight separate entity is established, but which is constituted and jointly owned by the researchers and research institutions with a stake in the data. Cooperatives can establish rules about the resources that members should bring to the co-op, and what control they can expect over the design and maintenance of the Observatory, and can provide procedures for easy entry and exit from the co-op. In Manchester we discussed the potential for hybrid ‘workers/suppliers’ and ‘users/consumers’ co-operatives, that could give both the creators of data, and the researchers using the data, an appropriate stake in it. Co-operative membership to access data with privacy/ethical issues could also address ethics procedures. Whilst the least developed, this third option I think holds most promise. I’m co-chairing a track on ‘Open Data, Transparency and Open Innovation‘ at the next CeDEM Conference for E Democracy and Open Government, taking place at Danube University Krems in May next year. Open data policy and politics: opportunities and challenges for governments; the global spread of open data policy; transparency and accountability, economic innovation, drivers for open data; benefits and challenges for developing countries. Licensing and legal issues: copyright vs. open licenses & creative commons; Freedom of Information and the ‘right to data’; information sharing and privacy. Submissions are due by 6th January 2014. Cross-posted from the Open Data Research network site. On 1st August two IDRC research networks came together for a web meeting to explore Open Data and Privacy. The Privacy in the Developing World network, and the Open Data in Developing Countries network set out to explore whether open data and protecting privacy are inherently in tension, or whether the two can be complementary, and to identify particular issues that might come up around privacy and open data in the developing world. This post shares and develops some of the themes discussed in the meeting. Open data is generally defined as data made accessible, in formats that can be manipulated by computers (allowing the creation of new interfaces, mash-ups and other data analysis), and without restrictions on how the data can be re-used. In essence, open data asks those who hold data (usually governments) to give up formal control over how it is used, with the idea that this allows greater scrutiny of governments, and unlocks potential for innovation with the data. Privacy, by contrast, is concerned with control over information, who can access it, and how it is used. As Daniel Solove notes this has many dimensions, from concerns about intrusive information collection, through to risks of exposure, increased insecurity or interference in their decisions that individuals or communities are subjected to when their ‘private’ information is widely known. Privacy is generally linked to individuals, families or community groups, and is a concept that is often used to demarcate a line between a ‘private’ and ‘public’ sphere. Article 12 of the Universal Declaration on Human Rights states “No one shall be subjected to arbitrary interference with his privacy, family, home or correspondence, nor to attacks upon his honour and reputation”. It has been argued that privacy is a western concept, only relevant to industrialised societies – yet work by Privacy International has found privacy concerns to be widespread across developing countries, and legal systems across the world tend to recognise privacy as a concern, even if the depth of legal rights to privacy and their enforcement varies. It is worth noting though that few of the countries covered by the ODDC project have strong privacy protection laws in place. Public service data – data about the activities of government – ranging from the locations of public services and their budgets through to public registers, and detailed performance statistics on schools, hospitals and other facilities. This last set can be in a grey area – as they are often built up from the aggregation of records about individual users of public services, and it is not always clear who they are about. For example, is the medical record about an operation and it’s outcome data about the patient, or about the doctor? Personal data – data about individuals, and usually things that an individual would have a legitimate right to manage access to – such as information on their sexuality or their health. In the Web Meeting, Sam Smith noted that the framers of the ‘Open Definition’, taken as a basis for much open data advocacy, were focussed specifically on non-personal data, and that open data advocates tend to make clear that they are not talking about information that could identify private information about individuals. However, as the categories above show, the dividing line between public and personal data is not always clear. This classification does make clear however that there are some kinds of data (the infrastructural data) where applying open data should be, from the privacy perspective at least, uncontroversial. The relative importance of data in the middle category to the kinds of outcomes sought from open data policy interventions then becomes an important question to ask. It is worth noting that because of the political popularity of open data policy, there has been a tendency for other policies relating to data to be presented under an open data banner in some countries. For example, policies on the restricted sharing of medical records with pharmaceutical companies (through secure data sharing rather than as open data) were included in UK open data measures in 2011. These policies clearly need to be considered distinctly from open data policies, and their implications also weighed carefully. Steve Song offered an input into the Web Meeting focussed on the online publication of a dataset and mash-up map showing the location of registered Gun Owners in the wake of a school shooting in Connecticut. The register of gun ownership had long been a public document, but it had been in the form of documents that could be inspected rather than as a dataset. The conversion of this public register into open data which could be easily mapped created a strong backlash: law enforcement officials worried that their addresses had been revealed online, and those with and without guns expressing concerns that the information could be used by burglars to target particular houses. The accuracy of the record was also questioned, and it was suggested that much of the information was misleading or wrong. This case illustrated how turning existing ‘public records’ into open data might change some of the balances around privacy that have been struck by the practical difficulties that exist right now of access to those records. Previously the ‘data’ had been hidden in plain view: but no-one had been encouraged to use it in ways that might give rise to concerns. Thought may be needed then not only when things previously secret are made public, but also when public records are turned into more easily manipulated and processed open data. Steve noted that this may be particularly important in contexts of ethnic or communal tensions: imagine for example how voter registers might be used as data where ethnicity can be inferred from the voters name, and where an election is contested on ethnic lines. In the United Kingdom, the recent Shakespeare Review of Public Sector Information has proposed shifting the legal responsibility for mis-used of data from the person who publishes the data onto the person who abuses the data – suggesting a model in which privacy laws would control (ab)use rather than access to data. However, such a model is tricky to envisage in a world where data can cross borders easily, there is little harmonisation of privacy laws, and harms from privacy violations can also cross borders. Privacy as an excuse? Open as a general principle? One of the key concerns raised in the meeting was that if arguments for open data are applied as a ‘general rule’ without sensitivity to the kinds of data in question, there are significant risks that privacy rights might be undermined. Yet, transparency and open data advocates are often concerned that ‘data protection’, or ‘protecting privacy’ might be used as excuses not to release data, or to only release data in aggregated forms that don’t permit detailed analysis of what government is doing. Neither can necessarily be used as a principle that trumps the other. In his review of open data and privacy for the UK Government, Kieron O’Hara noted that, even within open data advocacy, different groups have different requirements for what for good quality open data for their purposes (§2.1.4). For example, transparency campaigners may be happy with crime data covering general geographic areas that particular official is responsible for, whereas entrepreneurial re-users of data might want data down to the individual street and house-level to feed into risk models for insurers, or to use in route-planning applications. In our web meeting Steve Song suggested that by developing a clearer picture of the kinds of impacts open data can have, and the ways in which it might be used (a central theme in ODDC explorations), we will be better able to have informed debate about the trade-offs between privacy and open data. This again moves away from the simple rhetorical message of ‘open everything’, and ‘raw data now’ that many open data advocates have pushed for – and suggests that deeper debate will be needed over the sharing of datasets that fall into the grey areas between public and personal. Such a debate will need to engage with questions of whether open data is being used to support public goods or private gains, and with nationally and culturally specific judgements about how to manage trade offs between public good and personal or community privacy. For example, in some countries, personal tax records are considered public and are published, yet in others, these are judged to be private data. The question of corporate confidentiality was also raised in the web meeting discussions. Although corporate confidentiality is conceptually distinct from privacy, it is another principle that might sometimes be found to be in tension with a drive towards open data, and can become the grounds of excuses for not releasing data. Distinguishing when privacy or corporate confidentiality are being used as excuses for not releasing data, or when they are based in serious and valid concerns, will be important for open data advocacy. In practice, it wasn’t clear from web meeting participant’s experience whether privacy is actually being used as a grounds for restricting access to data in developing countries, or if privacy is being adequately considered in decisions about opening data. This will be a key issue to track in future research to better understand how potential tensions between open data and privacy are playing out in practice. At the Asia regional meeting of the ODDC project, one participant noted the curious overlap between participants in the Data Meet community (often involved in pushing for open data), and those organising ‘Crypto Parties’, teaching each other about privacy protection software. How have these individual reconciled campaigning for both open data and privacy? If they are pushing for a balance between the two, how is such a balance to be struck. One possible way to understand the compatibility of pushing for both privacy and open data is through the lens of power and autonomy. Activists may be interested in seeking maximum autonomy from the state through protecting their privacy, and maximum control over the state, through the ability to see what the state is doing through open data, and to work with state-collected data. Such a political position might be associated with the libertarianism of some open source geek cultures, but may also have different routes and political slants around the world. The power-based analysis might also help in determining which kinds of entrepreneurial uses of open data are desirable or not. Cases where entrepreneurs act as intermediaries in ways that enhance the autonomy of citizens (for example, providing public transport planning applications to help citizens move more freely through space, or informational applications that help citizens to collaborate and co-create or claim access to public services) may be seen as positive, whereas commercial open data re-use that leads to interference in individuals decisions through targeting of advertising, or that drive discriminatory pricing of services and insurance, might be seen having a negative impact on individual autonomy (although the negative effective may only be felt by some segments of the population such as minority or marginalised groups). The question however would remain of how such potential negative uses of open data should be governed, particular in developing world contexts where legal frameworks vary widely. Serious abuses of open data (whether to incite community tensions, or affect individuals through discriminatory pricing) could be outlawed, but if they have not, what should those releasing data consider? By the end of the web meeting we had opened up many more issues that we had resolved, but we had established that there can be a productive dialogue between privacy and open data, and that more work is needed to explore how the two concepts together are unfolding in developed and developing world. If you would like to join the debate over privacy and open data, there’s a thread over on the Open Data Research network Linked In group. Solove, D. J. (2005). A Taxonomy of Privacy. University of Pennsylvania Law Review, 154(3), 477. Shakespeare, S. (2013). 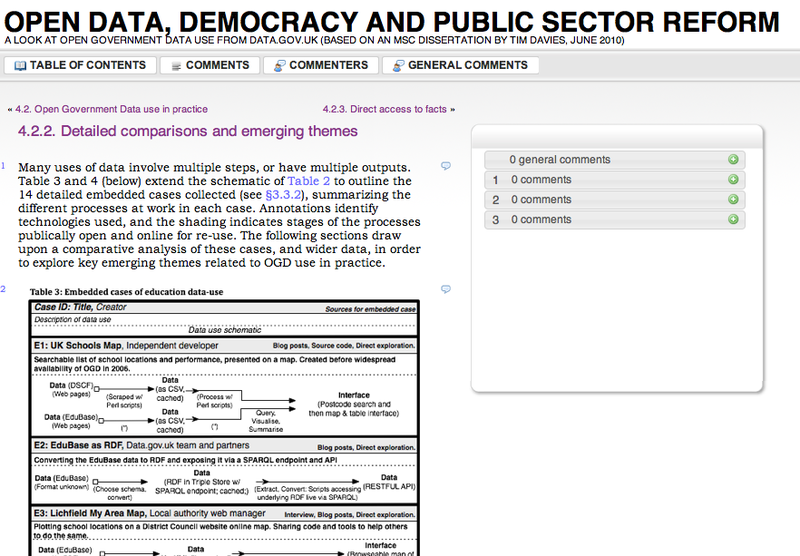 Shakespeare Review: An independent review of public sector information. London. O’Hara, K. (2011). Transparent government, not transparent citizens: a report on privacy and transparency for the Cabinet Office.